Our first day began by meeting Eric Miller and discussing Amarillo's place in Route 66 folklore, while enjoying an authentic Tex-Mex breakfast at Youngblood’s Café in Amarillo. He is the Director of Communications for the Amarillo Convention and Visitor Council and is Amarillo's Film Commissioner. Eric, who has lived in Amarillo the past eighteen years after moving from Nebraska, filled us in on the economic impact tourism has had on this city of 200,000 people and the importance of Route 66 going through it. He said the business owners along Route 66 have a "spirit reflected throughout the Texas Panhandle." "Sixth Avenue, Amarillo's stretch of Historic Route 66, with its many shops, restaurants, galleries, and festivals, is a true slice of Americana," he added. Our first breakfast on our Route 66 trip, at Tim Youngblood’s Café was great. 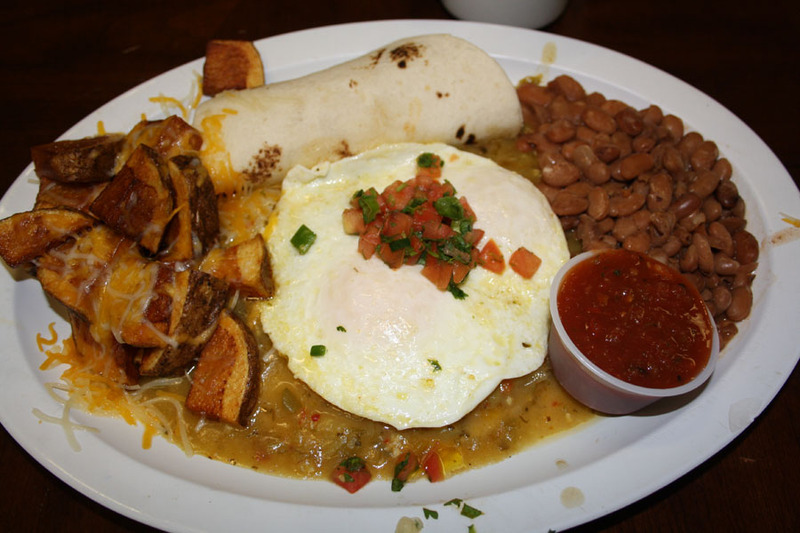 "There was no question that I was going to try Tim's Huevos Rancheros and he did not disappoint! So authentic and perfectly cooked with the most delicious blend of chilies. Along with a nice cup of coffee, our morning was off to a well-nourished start!," said Lorie. Tim Youngblood is the chef/proprietor of this popular restaurant. A native of Amarillo, Tim worked in the restaurant business in Amarillo for almost 20 years until he enrolled in the Culinary Institute of America in Hyde Park, New York. After graduating with highest honors, he began an illustrious career as a chef in fine dining establishments in New York City, including the Harbor Lights Restaurant and the Oak Room in the Plaza Hotel. 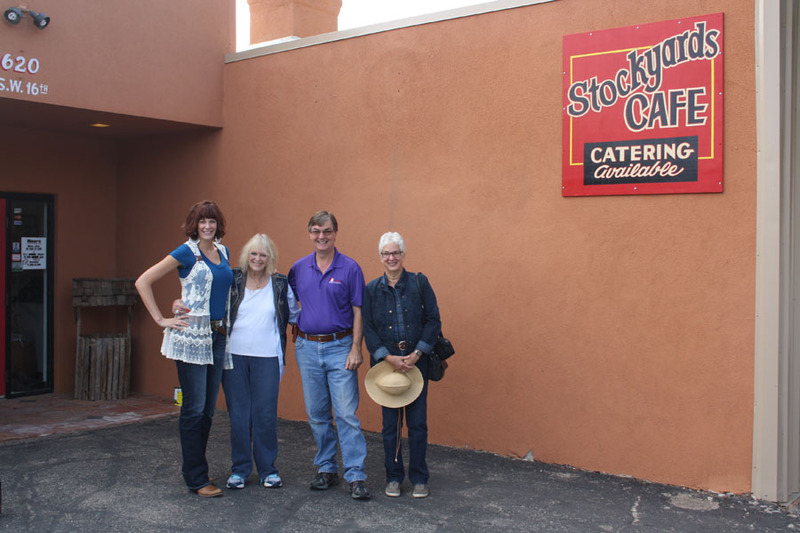 Tim always wanted to return to Amarillo, so in 2000 he opened the Potter County Grill there and one year later received an invitation by the owners of the Amarillo Stockyards Auction to relocate his restaurant to the Stockyards. In 2013 he moved to his present downtown location. Tim specializes in Texas Home Cookin' and also offers catering. 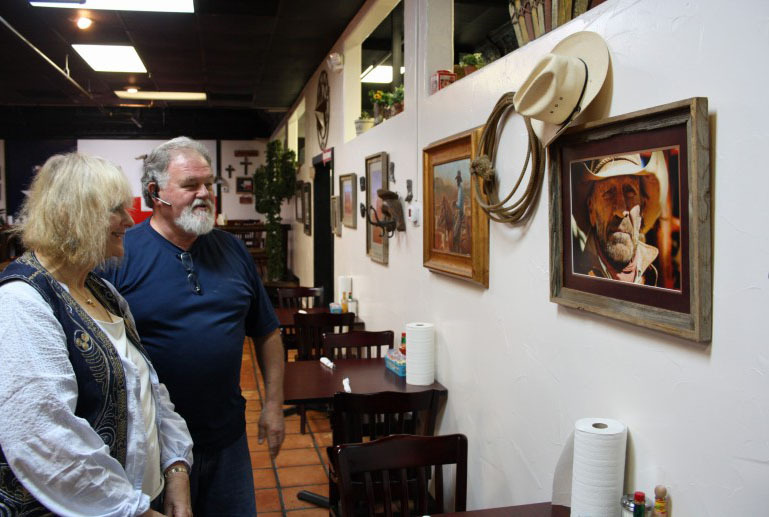 In one of the dining rooms, Tim features his "authentic Western art collection" on the walls. Of particular interest are the paintings of one subject, Shirley "Shy" Hearst. Tim described him as, "a gruff and rugged cowboy who loved his cup of coffee when he came into the restaurant." One featured artist participated in the barter system with Tim. When the art business was slow, he'd trade his paintings for meals. After breakfast, armed with interesting facts about Amarillo and the Route 66 stretch of the city from our conversation with Eric Miller, we continued on to see the first of four places Eric arranged for us to visit, Lile Art Gallery.